Hello. My name is Jill and I'm a theater-aholic. It had been two weeks since I'd been to the theater, and I didn't have anything on my schedule for another two weeks. A month without theater, perish the thought! So when I received an email telling me about Girl Friday Productions' Street Scene, I eagerly looked it up. A theater company I'd never seen, a location I'd never been to (the funky Minneapolis Theatre Garage), a Pulitzer Prize winning play from 1929 about immigrant life in a NYC tenement - sold. As one of the characters in the play says, "you never know, when you get up in the morning, what the day will bring." Unlike the tragedy that the day brought to the characters in the play, my day unexpectedly brought a wonderful and moving experience at the theater. 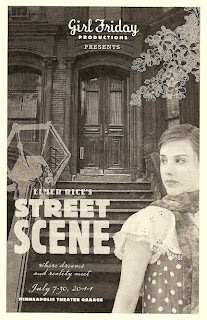 Street Scene was written by Elmer Rice and first produced on Broadway in 1929. The entire three-act play takes place on the streets and stoops in front of a NYC tenement building, teeming with life of all flavors. The mix of accents is a delight to the ear - Irish, German, Italian, Swedish, and New York "natives." 20-some actors (including several children and a dog) play 50+ different roles, some as small as a man who strolls down the street singing and is never seen again, or a little girl being reluctantly pulled along by her mother, or a milkman making his deliveries. The busy sounds of the street are playing softly throughout the play, as well as 20s-era radio (songs, ballgames, talk) playing during intermission and before the show. It all sets up the environment of the show: a close, supportive, and contentious neighborhood in which the neighbors all know each other - perhaps a little too well. The show starts off with everyone mopping their brow and asking "hot enough for you?" - a scene that could have been lifted from just about any neighborhood in the country right now (I suspect that the "it's not the heat it's the humidity" line might have been added to cater to local audiences). The first act establishes the characters: the gossipy and bigoted Mrs. Jones, with her bully son Vincent and flapper girl daughter; the Maurrant family, sad suffering Anna and her abusive husband and idealist working-girl daughter Rose; the outspoken Bolshevik Mr. Kaplan and his smart student son Sam, in love with Rose. The characters have long conversations with each other, both philosophical and practical, and gossip about their neighbors behind their backs. The chief object of gossip is Mrs. Maurrant, who appears to be having an affair with the milkman. Things start to happen in the second act. Vincent torments Sam, and he and Rose talk about running away together, getting out of the tenements. She's hopeful of a better life; he believes life is nothing but pain. He has a serious case of Weltschmerz, as his father points out. Mr. Maurrant goes off on a trip for a few days, and Mrs. Maurrant invites her milkman up. In true soap fashion, her husband returns to find them together and (spoiler alert) kills them both in a bloody and action-packed scene. In the final act, Rose is forced to grow up fast and make a new life for herself and her little brother. She plans to leave town, and Sam wants to go with her, declaring his undying love for her. But Rose gently refuses him, putting her in the position of having to comfort him (which doesn't seem fair since she's the one who's just lost both of her parents!). Rose says people shouldn't belong to anyone but themselves, and that was part of what caused her parents' problems. She's determined not to fall into the same trap. As the show ends, modern day sneaks into the old neighborhood: a Lady Gaga song is heard, a man enters with a cardboard coffee cup and Target bag, and a boy rides a skateboard while listening to an iPod. Life goes on, not so different now from what it was then. The Theatre Garage is a small space with a small stage, but there's nothing small about this production. The large cast fills the space and moves around and through it with ease (as directed by Craig Johnson). It's a strong ensemble; most of them are new to me. Anna Sundberg is luminous and captivating as Rose, and Logan Verdoorn is heart-breaking as the serious studious Sam. John Middleton (Theater Latte Da's Song of Extinction) brings a strength to the frail old Mr. Kaplan. Ellen Apel provides much of the humor as the busybody Mrs. Jones. Kirby Bennett conveys sadness and longing with a look as the poor Mrs. Maurrant, and Bob Malos as her jerk of a husband is infuriating and somehow almost sympathetic. It was a thrilling, engaging, tragic night at the theater. From what I gather, Girl Friday's shows are few and far between, but judging from Street Scene, it's worth the wait. Thanks to Nancy for telling me about this show, that otherwise would have passed me by without my knowledge. Please, friends, be my enablers in my theater addiction. Tell me about theater going on in the Twin Cities that I might not have heard about, so that I don't have to go two weeks without going to the theater again.